I think I got this book last year, but for reasons unknown, I never got round to reading it. Very strange, especially since I loved The Goose Girl by Shannon Hale, and the Books of Bayern series in general. But, no worries, since I remedied the problem by finishing this book on the way to and from Dazaifu. 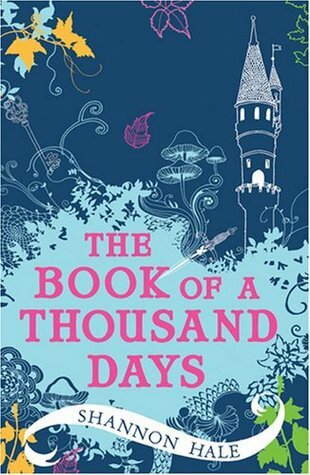 The Book of a Thousand Days is a retelling of the Grimm fairy tale Maid Maleen. Basically, a servant girl called Dashti has been locked up with Lady Saren, as her Lady refused to marry a different Lord. But her Lady seems to be having problems, and she makes Dashti pretend to be her when some other Lord (whose suit she accepted) comes for her. After a few years, they escape, and get to the other Lord's place. But the story isn't over yet (of course). Throughout this story, while I was reading the names and looking at the illustrations, I thought, this looks a lot like the Manchu style and while I wasn't completely right, I was close. The customs were based on ancient Mongolia. How cool is that? Another thing I found interesting was the character of Lady Saren. She's not a brat, but she's not brave like Dashti. Instead, she seems to be very trouble, psychologically. She made me think of another book, which I had to Google for just to find the title. Turns out it's The Phoenix Dance by Dia Calhoun. At any rate, I found her to be an interesting side character, although she doesn't seem to develop very much. Plus, Dashti is totally a protagonist I can root for. The book is told entirely through her point of view, and her loyalty to someone as child-like as Saren is admirable. Plus, she can sing and her singing is powerful! (Not gonna say more, in case I accidentally something away). As expected from Shannon Hale. After this, I need more fairy-tale retellings, STAT. Although sadly, The Phoenix Dance doesn't seem to be available for lending. It does look that way (: I think if you wanted, you could probably colour the sketches.